Brexit: What's behind Donald Tusk's Instagram diplomacy? Donald Tusk rejected Theresa May's Brexit proposals at an EU summit this week and posted an Instagram story shortly afterwards. "A piece of cake, perhaps?," said the head of the European Council, alongside a picture of him and May at the summit in Austria. "Sorry, no cherries." This provocative post was Tusk's idea and is part of a wider strategy to appeal to young people via the app, an EU source has told the BBC. Here are five things to know about how Donald Tusk and other EU leaders use Instagram. "He's the one coming up with these posts - he has a good sense of what works and what doesn't," says an EU source working with Tusk on social media. "He's not the biggest social media geek but he likes it. "He jokes and laughs and wants to show humour. This post was clearly something he was into - we produced the image [of cherries] and he said let's do it!" The post combines the EU's favourite Brexit cliches. 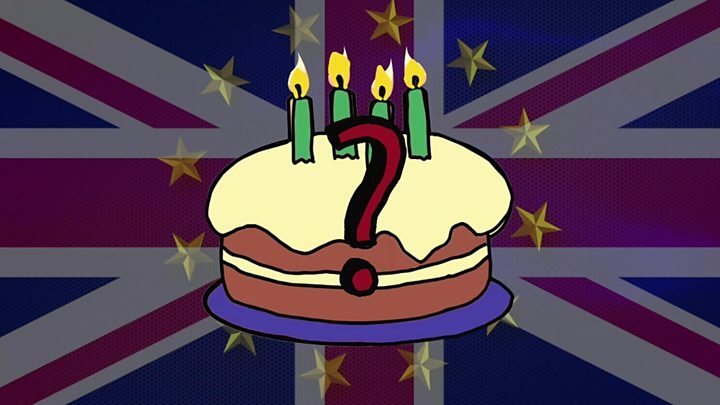 First, the idea that the UK wants to "have its cake and eat it". Second, that the UK is guilty of "cherry-picking" - keeping the bits of EU membership it likes and ditching the bits it doesn't. Many Brexit supporters reacted angrily to Tusk's post on social media. Conservative MP Charlie Elphicke described the post as "extraordinarily disrespectful". Pro-Europeans had mixed views, with one describing it as "brilliant trolling" by Mr Tusk, while another said it was "grim and not on, frankly". A source close to Tusk said the message should not be taken too seriously. "It was an innocent gesture. He is always expressing how sad he is about the U.K. leaving. "We were taking the difficulty of the situation and giving it a soft touch." Tusk's team did an in-house analysis of various social media platforms and ultimately decided to focus on Instagram, the BBC understands. They found that while Twitter is useful for communicating with journalists, not so many other people people use it regularly. However, Tusk did post this bombastic video on his Twitter account, showing his Autumn priorities in the style of an action film trailer. Instagram, on the other hand, is very popular with a range of groups, especially younger people. "We have political messages but we also want to move away from the cold politician image," an EU source told the BBC. "For example we launched on his birthday with a picture with his grandchildren, and this kind of personal touch has proven really successful." My grandsons are setting up Instagram for me as a present for my sixty first birthday. 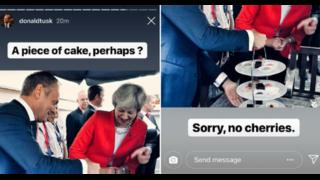 As well as transmitting the EU's core messages, Instagram can also be a place where politicians can joke and show a sense of humour. "It's more positive, everyone is cheering each other," said an EU source. "We are reaching different audiences and the discussion isn't so violent." Tusk's Instagram account combines serious messages with light-hearted pictures - sometimes in the same post, including one notable example from the Salzburg summit. "We aren't focusing just on the political angle and we showed that with the ice cream - it's fun but also has a message," said an EU source. "Eating an ice cream is sweet but the expression is sour, talks are tough but it's important to be managed." The press teams in the European Parliament and Commission have noticed the effort put into Tusk's Instagram and are paying attention, according to an EU source. "All around the EU everyone is on Instagram. It is new and we need to use it." German Chancellor Angela Merkel was an inspiration for Donald Tusk - she has long been active on Instagram but not Twitter. "We are still communicating the position of the EU, it still has to reflect this but with more emotion." Although Donald Tusk's Instagram account has received a lot of attention from political journalists lately, he has a long way to become the biggest name in his own family. His daughter Katarzyna, an Instagram influencer in her native Poland, has more than four times as many followers as her dad. Her account combines "photography, style and daily moments".